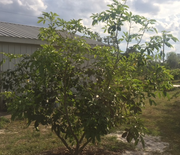 I bought an Angie, which apparently produces great fruit in south florida's soil, but on sandy soil (what I have) the fruit are not good. mangos perform differently each year? How many years has the Angie been bad? No the calycina didn't have salmon colored sepal leaves or new growth. Do they taste different/better this year? and the Thai dwarf seems to be smaller but very prolific. Hopefully you will get allot of practice picking them! I like the reds better a little under ripe when they are red colored. I am also paranoid the birds will figure them out if I wait. New arrival Eugenia calycina a wonderful fruit! Tropical Fruit Discussion / Re: White sapote thinning ? Will you have scions available for sale? Wow. Wish I had that tree Where did you pickup the supersweet? I got the supersweet from Fruitscapes. Will you be offering some seeds? Here's some pictures Do I need to thin this fruit? In July there is a mango mania weekend at the German American Club on Pine Island rd. picked their favorite, my wife had hers, the lady who worked for Fruitscapes had her opinion. I would go lychee over longon. Not as productive but even a slight winter storm will knock a longon to its roots and a lychee wont care. Figs do well. Mangoes need protection, Key Limes will grow great, loquats will do great. I would reconsider a longan instead of a lychee. They produce more consistently. I have 2 kohalas and this is 2 years in a row they are loaded with flowers again. like the fruit. The tree is 3 years old and about 6' x 6' and has about 25 fruit. it does the same in the ground? months. His tree was not effected by the hurricane. Is your tree full of flowers? high and almost just as wide. I didn't get flowers or fruit last year. I indeed got the seedling from a forum member who lives on Pine Island. I am glad to hear it is flavorful. Do you know if it is self pollinating? best way to go? Does anyone have experience with Silas Wood Black Sapote?